I used a gouge to chamfer the inside curves and cleaned them up with a small round file. All straight edges and outside curves were chamfered with a straight chisel. 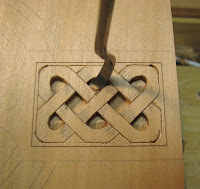 Just another option if you plan to try this type of carving. 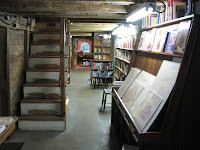 Baldwin's Book Barn, located in Chester County, PA, is 4 stories of ruggedly-built shelves that support over 300,000 used and rare books. The main portion of the store is a former dairy barn built in 1 822. Original flooring, rafters, and doors remain, providing the proper setting for the collection. A grassy embankment behind the barn slopes upward to the second floor, enabling the 19th c. farmer to easily mo ve things to the upper levels. 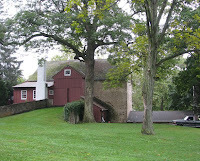 This embankment is characteristic of a Pennsylvania Bank Barn. 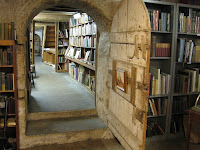 Inside is a catacomb of tomes. Stacks and shelves and row after row of hard to find and out of print literature are a book-lover's dream. 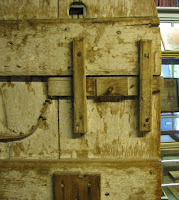 I found the handmade lock on the door that leads from the lobby to the barn particularly interesting. The bowed piece of oak on the left, which was originally lo nger and has since snapped off, acted as a spring mechanism to slap the bolt shut as the farmer closed the door, thus keeping ol' Bessie from getting loose. 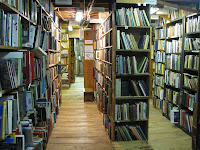 It's nearly impossible to leave the store without finding some must-have book. I purchased three. One is a book on Pennsylvania Dutch furniture ($27) and one is about handtools ($4). You may notice a few loose papers sticking out of the handtool book. Baldwin's includes whatever papers were tucked within the book by the previous owner. Mine contains articles about woodworking that were clipped from local papers in the 1970's. So, what's the unassuming little brown book? That is a 1952 reprint of The Village Carpenter, by Walter Rose ($12). You never know what little treasure you'll find at Baldwin's, but no doubt, you will find one. N.C., Andrew, and Jamie Wyeth's paintings figure prominently in the galleries at the Brandywine River Museum in Chadds Ford, PA. Photos of the artwork are not permitted, however I was allowed to photograph this elaborately carved coat of arms which originally adorned the pediment of the Dauphin County Court House in Harrisburg—Pennsylvania's capital city. The carving, created in 1861 by E. Omensetter, was constructed with four horizontal pine boards used as a backing for the pine relief carvings that were attached with nails. Originally painted, the coat of arm's colors were worn away by weather and age. The state's motto, "Virtue, Liberty, and Independence," is deeply carved into the banner, and the other design elements are also representative of Pennsylvania. The ship symbolizes the state's ports and vast commercial network; the American eagle is the traditional symbol of liberty; the horses protect and honor the motto; the plow represents coal and mineral resources; and the wheat and corn depict Pennsylvania's agriculture. 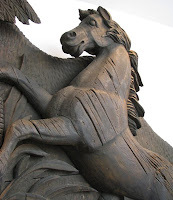 I love the chunky gouge marks and stylized eagle and horses. The beefiness, the deep shadows, and the folksiness of the design seem to accurately portray PA, which is replete with farmland and steeped in history. While I enjoyed the Wyeths' and other artists' paintings, I found myself lingering in front of this piece longer than any other. Is it just me, or do all woodworkers find boxes irresistible? I'm especially attracted to small ones that you discover tucked behind a mountain of other goodies at an antique store. The desire to open the lid to see what the box contains is unsquashable. Even if it turns out to be empty, it was worth looking, wasn't it? The writing box features a 1/16" thick lid with detailed pull for a small compartm ent, and 1/16" thick tongues on the breadboard ends of the writing surface that conceals a larger compartment. Details like this reel me in. 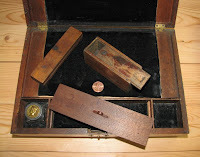 A little finger-jointed box (also box-jointed), measuring just 1 3/8" x 3 5/8" x 1 5 /8", has a sliding lid with finger pull. All the pieces are 1/8" thick. 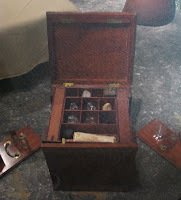 I have no idea what a miniature box like this might have housed. Maybe drill bits? 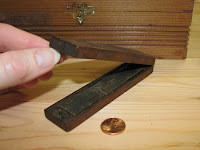 Another one of my favorites is a sharpening stone holder that measures 1" x 4 5/8" x 5/8". The lid is hinged and a pin keeps the lid in place. 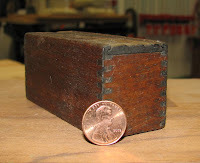 The recess that holds the stone was removed with a chisel, so this box started out as one piece of wood. The stone also started out as one piece, but quickly became two, as I promptly dropped it upon leaving the antique store where it was purchased. 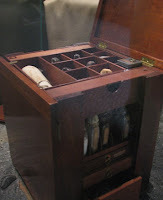 It might be the spirit of discovery that drives my box attraction—the same reason I love to poke around shops belonging to woodworkers who are pack rats. My shop is on the tidy side, so it's a little dull. But shops with stacks of "stuff"...well, they're just the bee's knees. wait for it.....the box's knees. Christmas will be here before we know it and if you plan to make gifts, it might be a good time to start. If you're like me, projects usually take longer to build than anticipated. 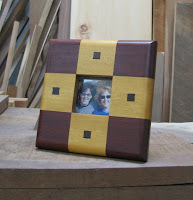 You can make simple and attractive picture frames from 2" square pieces of wood. It's quick, it's easy, you can make a bunch at a time, and it cleans ou t your offcut bin. I used purpleheart and yellowheart with ziricote pegs for this frame. 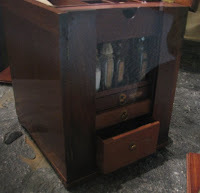 The back is recessed with a router to allow space for glass, photo, and backer board, which are held in place with bent wire. The ends of the wire are glued into predrilled holes. 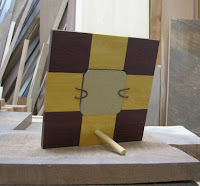 The frame stands upright with a dowel that is plugged into a matching-diameter hole. 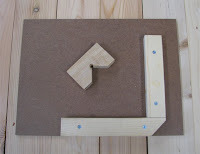 You can glue the dowel in place or not, if you want the option to hang the frame on a wall. To glue up th e frame, I used a jig made of 2 strips of pine screwed to a board, and a loose block of wood with a 90º corner cut into it. 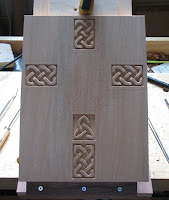 (I drilled a hole at the cut-out corner of the loose block to allow for glue squeeze out on another project). The best thing about this jig is you only need one clamp to use it. It's a good idea to lay a sheet of wax paper beneath the frame so it doesn't stick to the jig. The other thing I did was place a loose 2" square block in the middle of the frame to help keep the frame squares in alignment during glue up. 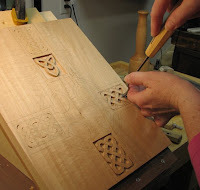 Rub plenty of wax on the middle square so it won't stick to your workpiece. Okay, elves...time to get to work! 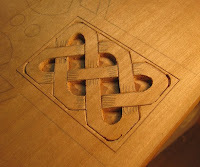 Trying to the flatten the spaces between the knots in a Celtic cross is difficult with a chisel. Typically, you wind up with a 4-sided raised pyramid as you work the chisel into the wall of each knot, as shown in the first photo. I tried using the chisel like a scraper with fair results. But a gift certificate to Woodcraft for my birthday from my partner's mom presented a much better option. I purchased 3 bent chisels which gave me the leverage and angle I needed to remove the pyramid and flatten the background areas between each knot. You can see how well it worked in the two square-shaped recesses in the third photo. The smallest bent chisel is less than 1/16" wide and works great on the skinny perimeter of the design. Another one of my favorite gifts was a book that I had found in the Woodworking Library of Dan's Woodshop. I noted a number of other books that will be added to future wish lists. 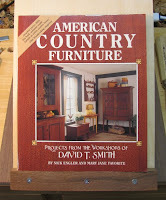 American Country Furniture showcases projects built by The Workshops of David T. Smith. The projects range from very simple (spoon rack) to more challenging (corner cabinet). 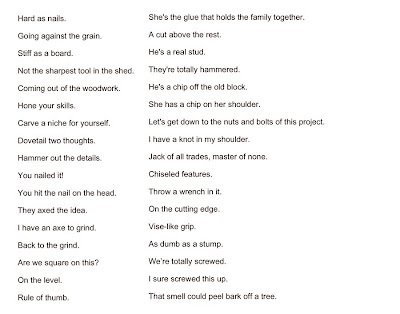 A short description of the origin of the piece precedes the plans and cut list for each project. The p hotos are black and white and the step-by-step instructions are well-illustrated. I've already dog-eared about half of the pages in the book, which mark construction techniques or projects I'd like to build, like the ratchet candle stand. It's a fun little book which would appeal to anyone who loves simple, country furniture. The Long's Park Art & Craft Festival is a juried exhibition of the products made by talented craftspeople who work in a variety of media. 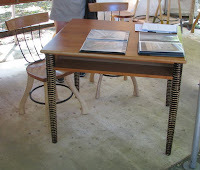 I sought out the woodworkers, of course, and asked them about their pieces. First I encountered Joe Graham (Photos 1, 2, & 3. 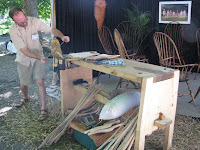 Photo #2 is from Joe's website), Windsor chairmaker and instructor/owner of Lenox Workshops in Ohio. Joe works with handtools and at the show used a workbench made from 3 slabs of thick, single-dovetailed wood, a stretcher, and tusk tenons. 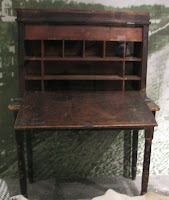 The bench didn't rack at all while he used a drawknife to shape spindles, so it was an effective, knock-down workbench—perfect for travel. Joe, who studied with Mike Dunbar and Ernie Conover, offers week-long classes, including private room, all meals and materials. 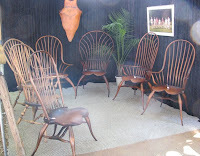 By the end of the week, you will turn a log into a Windsor chair, using only handtools. The classes focus on several styles of traditional Windsors, but Joe also offers his own adaptations in his product line. Next, I met Sam Martin (photos 4, 5, & 6), who makes intricately-detailed scale reproductions of a multitude of vehicles and who co-wrote Making Toys: Heirloom Toys to Make in Wood. As if the amount of work required to construct his pieces wasn't impressive enough, he pointed out that all his vehicles have moving parts. Doors & tool boxes open, gates fold down, fire truck ladders extend, and spreaders on road graders move sideways and foreward and backward, just like on a real one. The logging truck was my favorite and he explained that the miniature logs were cut from saplings on his property. I asked how he made the tire treads (shown on the road grader and on the vehicle above the cattle truck). He cuts the circle first and then uses a table saw jig which is equipped with a protractor that indicates where to cut the treads. His products make great gifts for collectors as well as grandkids. But if they were my grandkids, I doubt I'd let them play with these beauties unsupervised! Brad Smit h (photos 7, 8, & 9), owner of Bradford Woodworking, studied at R.I.T. and belongs to the Pennsylvania Guild of Craftsmen. Brad builds unique and custom pieces, some of which incorporate h is signature design element—ax handle legs—which are turned on an antique ax handle lathe. The lathe leaves a ridged pattern on the wood which ax makers would sand smooth. Brad instead allows the ridges to remain, which gives his pieces a handcarved, organic look. His tractor seat stools, which include ax handle legs, also feature a reproduction tractor seat, produced by an Amish foundry in Lancaster County, P A, that comes complete with the Bradford Woodworking logo. Be sure to check out Brad's website and also his blog. 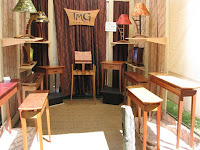 The last woodworker I met was Todd Gill of TMG Designs (Photo #10). Todd is a recent graduate of East Carolina University and worked collaboratively with Brian Bortz to design the sofa tables in his booth. Brian designed the shape of the tables and Todd constructed them and designed the decorative inlay, made from metal and colored resin, for the table tops. All other pieces in Todd's collection are designed and built solely by him. He mainly works with veneer over mdf, which enables him to control wood movement and allows him to use highly figured species. The designs have a contemporary feel, and Todd told me his products sell better in certain larger cities t hat appreciate modern furniture. The market, he said, changes with each year and it's difficult to predict when pieces will sell or not. Todd works part time in his business, participates in 10 shows a year across the country, and works as a sub contractor for other furniture makers. 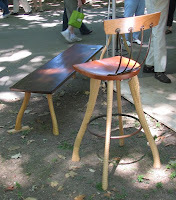 He was also the youngest participant at the show, in his early twenties, and it was refreshing to see this kind of talent in a young woodworker. 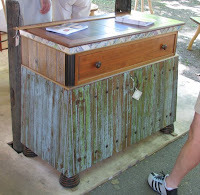 Be sure to visit the woodworkers' websites for more information about them and their works of art.